Wow, just wow, I have no idea where to begin. You have awesome talent! The Art Nouveau Tyleet/Scouter one is awesome- a series of Art Nouveau inspired pictures would be great to see- I do confess, this is very selfish request, for it is one of my favourite art genres. I'm totally in awe with the photograph of Pike (and glad you used him, he gets far too little attention, that's why my selfelf is his aunt ) The difficult pose, Skot and Krim on the back, the joyful spirit captured in his eyes, the light falling down and the little detail of rabbit munching whistling leaves! Amazing! And then the technique part- to make it all look as if seen through a glass, as if any moment now Pike is going to crash into the camera that just took that picture...sorry for repeating, but you do have amazing talent. Cutter with his wolf is very manly and somehow reminds me of a western movie- I can't really put my finger into it. I hope we indeed will see much more pictures here! Please continue doing your magic symbols for our eyes to see with joy. I that you decided to make a thread, too. Great shot of matured Cutter - inventive pose. Your first wolf turned out wonderfully ... maybe a tad too human araound the eyes. I love how wolf and elf look equally intend and concentraded. The black (inked?) grass and leaves make a good contrast and an amazing background. I like how their foreheads touch faithfully and Scouter's tender gesture. This reminds me of an art nouveau glass painting. I feel with the cute rabbit - I want him escape and be save. And I want Pike being successful - feeding his family and get their admiration. The movement - the perspective - extraordinary. There is so much fun and eagerness in Pike's expression ... so typical him. Skot and Krim in the background are a perfect addition. Oh ... and I love that the rabbit is munching! I could go on and on about the awesomeness ... Moonmoss worded it so much better. Awesome portrait of Dreamcat! She's so awake, so lively ... so present (missing the right vocabulary :/) Bright eyes, bright but delicately shaded colors, rich details in jewelry. I admire your skill for lively expressions - and for drawing hands. I've fallen in love with your elves. Your sister "Tulip" looks dreamy with soulful eyes. The colorful tulips are a lively contrast to the dark lock and tan top. I love how the lips match them in a darker hue. I've loved the sketch ... I can only adore the colored piece of Dreamcat and her bond"biest" ! The cat is incredible - both relaxed and attentive. The way the eyes meet ... the watchful ears, the sriped fur with the white sock(s) and muzzle - wild and cute. I love that Fuyu uses Dreamcat as a cushion - SO typical! Dreamcat herself is melting with the ground ... just the red mane and fair skin standing out. I love how relxed she's lying there - and that her eyes match Fuyu's. She's clearly talking to her companion ... and te cat is understanding well for sure! Background bushes and the delicate blossoms in the foreground frame the peaceful scene perfectly. Love to see Dreamcat as a symbol maker ... using the cat tail as a brush is unique and hilarious Dreamcat seems to think similar about it - her amused expression proves. For full view check out my gallery! Forest and grass have just the right hues of greens to create a lively mood I like how the dark woods in the background are mirrored by the dark grass in the foreground - very harmonic. Pike got his chance to shine - in more than one way I love how he literally got a spotlight. The choice of colors makes him and the rabbit a unit while Skot and Krim are melting with the background. Thank you Embala! You should get paid for comments like that! Wie hast du das Bild verlinkt? Oh, this time Embala said it so right- Pike got his own shine and spotlight while others blend to background- beautiful colouring indeed! And your use of light is fantastic. The picture from sunvillage made me smile- boys are boys...bad scenery for Newstar- had it been any other Wolfrider they'd probably just grabbed the tail and munched it for a snack..The surface of the hut is very beautifully done, it seems to be shimmering in the sunlight. And I love to see Windkin and Mender being pranky kids. In fact I get paid for these comments ... each time more awesome art pops up! The sufferings of an elder sister XD ... hilarious idea with Newstar as perfect victim! Her terrified pose and expression are prizeless. Mischievous little brother is captured spot on. I love that Windkin is hanging in the air upside down - inventive pose. The coloring gives the hut a blievable "used" look and naks it shine in the desert sun the same time - especially the top seems to sparkle. The pearl curtain has pretty shimmering colors - good contrast for the "ugly" lizard tail. Makes me think ... has Fuyu ever gifted you with a lizard tail? Actually I've used the "square brackets" instead of the "angle brackets" (post changed the format) ... should work with both. The LINK address* is the one of the full seize picture; the second one the IMG address of the smaller picture you have chosen. * I've take the address I get when I click "show graphic info" (or something like that - it's translated from the German options). PCoquelin said it all with the eloquent empty space and few words. Alas, let me fill the space with words of praise and hope it just heightens the effect of PC's message! This tete-a-tete is pure magic. The soft,light colours blending into the shaft of sunlight and green shades of their clothes and the forest create a peaceful mood. Both elves are astonishingly beautifully done- looks like they're actually breathing- and you've captured both the astonishment in Nightfall's eyes and slightly parted lips and the slight loving, amused pride in Redlance's gaze as he creates his delicate gift to her. I howl in honour of you. Thank you both! Your words make me proud. I love doing this kind of (lineless) paintings. They teach me a lot about light and shadow and how they interact to create form. I´d love to produce much much more of these, but it´s actually very time-consuming to make them look good. The overall setting, the basic light and forms, are established quite early in the process. But without lines, these paintings tend to lack of dynamics, they often look stiff like statues. That´s why these pictures live on details. I guess 60-80% of the time is spent for detailing (hair, folds, all kinds of patterns and textures). The color comes last and is quickly done, since all the halftones are already there. This one took me aprox. 20 hours of work (still far too slow), ~2 hours to establish basic light and form, ~17 hours of detailing and ~1 hour for the color. So much for the technical part. Moonmoss described my intentions for this painting very well. For though Nightfall is in focus, I made this pic more for Redlance. He´s usually shown as the "weak" in this relationship. Some people even say that they don´t understand why fierce Nightfall is in love with such a "sissy". I think they don´t understand neither of them. I wanted to show how Redlance´s charme enchants and comfords, yet captures her. He´s the one who slowly, gently enwines around the heart he admires to hold it as tight as no one else could. In fact, he enchanted Nightfall so much, she couldn´t help but force her soul to recognize him. On the other hand, I think it speaks for Nightfall to choose the subtle, sensitive one over any tough, cool guy. When reading EQ for the first time, I immediately fell in love with those two and the kind of love they share. I've told you elsewhere that this one is too beautiful for words to me. It's ... enchanted. Moonmoss has said everything - and much better - as I could come uzp with. PC said it ... without words. It reminds me of some old painting ... I'm too much an ignorant in art knowledge to even try to point out style or artist. I only remember what I love - and this is definitly one of them. Thanks for the interesting insights in intentions, challenges and tecniques, Dreamcat. your picture of Nightfall and Redlance leave me speachless..
Oh yes, please! I always like to see "developement"
Wow! These really are magic symbols. Thanks so much for sharing your art here, it is absolutely beautiful! I'm also glad you are sharing your technique. It's always interesting to see how these beautiful pictures are created. The "Forest Glade" piece looks wonderful in b/w - nothing unfinished but a very own beauty!It's magical with and without colors. This one looks much darker than the colored version - like night and day. It's hard to imagine for me that this is actually the beginning of the fair colorful picture - and not a variant piece. Very interesting to see in comparism. Amazing Leafpath! The thick braid lying heavy on her shoulder, airy and delicate feather earrings moving in a breeze (that's how it looks to me! ), the carefully worked choker - all those details are only topped by the slightly surprised, concentrated expression. Is this a blush on her cheeks because someone "special" showed up? *wants to believe so* Lovely eyes and tempting lips. I like how the shadow of her hand is falling on the face. It´s not exactly the beginning, but one layer of the finished piece. You can call it the "contrast-layer", since it shows all the halftones. It´s darker, ´cause the "color-layer" has an illuminating effect and there is also a "light-layer" on top with the sunbeam and the magic sparkles. I've read Leafpath's comment - You.did. Had no doubt about it anyway. It´s not Elfquest, but Inuyasha is just another half-canine. ^^ The process so far took about 70 hours of work. It´s not finished yet, but I bet it´ll reach the 100hours-mark. 100 hours ... incredible. I'm sure it would be very interesting to see ... *sigh* ... but I'm closed out. I'm not on Facebook. I will not join there for EQ. And not for anything or anyone else. Not as long as there is no REAL need for it. I'm sorry, Dreamcat. EDIT: I don't think Inuyashi looks so good in the original comic. Gorgeous! And this is just the start? Seriously - the planing of this composition should have taken it's time. Rough sketching? Or do you "see" it in mind? Hardly with such a crowded piece. The faces are all different - features and expressions. And even this sketch shows special deatails. You must save more WIP shots of this picture! EDIT: There was a point when I thought it cannot become batter. And a point when I didn't see the differencies (but I'm tired and the picture is so big and crowded). And - THIS is far from being ready? *bows* to your artistic skillls - and your patience and ambition! Adorable. I searched quite an asortment of fitting faces for each character. The second night, I spent arranging them and making my choices about which faces I want to use. I also wanted the layout to tell the story and show the relations between the characters. And I tried to find a layout that captures the eye and leads it on an endless path. Although photo reference is a big help to archieve more natural results, it´s only a guide. Some faces may not fit perfectly in perspective or may be lighted from the wrong ankle. Inuyasha´s model had a beard, for exemple. Thank you so much for awesome outcome for my request, Dreamcat! I adore the picture. Others look very cool and handsome, you are so talented. Could I perhaps get a self-elf image? Is there a cost associated? I just LOVe the ART. Dreamcat: your work is splendid. Be sure I rarely say such a thing. Now for (positive) criticism: pay more attention to noses and lips. If you value such remarks, would you PLEEEEEEEEEEZE try your art on young Suntop? Yes: it's a request from me.. I have just too few good shots of him in his youngest years as it is. Back to THIS awesomeness! I totally love this series of portraits - starting to wait for another one with anticipation and impatience every evening. Redmane is a very handsome guy - very individual features. PROUD pose! Appealing cheek bones and eyebrows.I like that he looks like an elder - aged slightly in a very good way. Well working, careful details on his top. Your choice of background brings out his eyes really well! And the shine of his red mane - SPLENDID! The shiny golden jewelry, teeth pendants and blue eyes make a wonderful contrast to his dark skin and chestnut hair. Your shading is amazing. I like the feather adornemwent with the delicate pattern! P.S. : Is he another member of the new Holt? Moonmoss ... ... love her soft, dreamy look! WONDERING? Cute snub nose and capturing green eyes. The hair looks so fluffy. Once again I admire the delicate skin and the pattern of light and shadow. The "simplpe" pattern of the background mimics the forest background nicely. Redmane and Wolfdancer are part of the holt! Chief Wolfdancer is none other than angelalex242. :D!! I've known already about Redmane - nice to meet angelalex' char as well! He´s our tribe´s eldest, since he´s a firstborn. He spent most time of his life in wrapstuff, that´s why I still wanted him to look young for such standards. He´s our chief (as Leafpath already pointed out). He´s Ember´s and Teir´s son, so I wanted him to resemble them. His chief-grandparents Cutter and Khavi also have their influences here. In the "Fan-Characters"-thread it´s said, that she´s Redlance´s momy. I tried to give her the same pieceful, dreamy flair he and Tyleet share. And here she is! 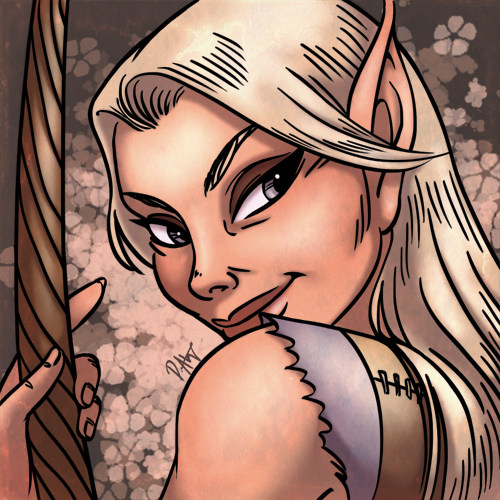 Another amazing elfess - I love her pale and tan colors. As I stated before - the teasing pose and mischievous expression are gorgeous. The eyes are matching her top - neat. She's actually looking at me! Watch me drawing Thorndust here! What drawing program do you use? and maybe it's cause its sped up a bit, but to me (and i know this sounds silly) it doesn't look like you use the pen/pencil/brush tool to draw, it looks more like you use ready-made lines instead. Or am I just imagining things? I use Photoshop and a Wacom tablet. I used the brush tool for the lines. The effect you marked actually comes from time-lapse. Screen-recording eats a lot of RAM, so I turned down the Keyframe-rate to leave enough to be able to draw properly. This is awesomne to watch! This "speed up" record and your skills make it look seemingly easy ... elegant. Thank you! I´ll upload some more soon to show some other approaches and techniques. @Crucent: Never mind.^^ I always try to draw a line in one quick stroke to make them clean and dynamic and to get that marker-like look. I flip or rotate the canvas to make it more comfortable for my hand. Sometimes I need to repeat until the line pleases me. @Embala: I know what you mean. I always watch other artist´s videos with open mouth. One can only watch the technique, which is quite simple in most cases, but to handle it properly it takes years and years of practice (in my case, it took 20 years), and massive background knowlege about surfaces and solid figures (like spheres, cubes, etc.) and their behavior in a three-dimensional room, especially when it comes to shading. Great video- thank you so much for sharing it...I was staring with my mouth open, basically drooling.. What size canvas do you use for these portrait/avatar pictures while you work on them? It would be great if you posted more stuff about making & tecniques as you said, it's always awesome and inspiring to see how real artists do their stuff- I'm just a hobbyist and am always agog of the talent of the real makers. And sometimes may learn a trick or two. Photoshop and Wacom..sigh..I used to have those too, before my old computer crashed- and now my laptop won't accept the old Wacom tablet with Windows 7, so I had to buy an el-cheapo Trust tablet and be contented with that and Gimp. But at least I have something to learn to draw with! Please keep making more magic symbols! 2nm @Embala: I know what you mean. I always watch other artist´s videos with open mouth. One can only watch the technique, which is quite simple in most cases, but to handle it properly it takes years and years of practice (in my case, it took 20 years), and massive background knowlege about surfaces and solid figures (like spheres, cubes, etc.) and their behavior in a three-dimensional room, especially when it comes to shading. "Ganz einfach wenn man's kann!" It's fascinating to look at the result of such life-long training. 20 years ... ... you've started early! I use a 1000x1000 pixel canvas with 72 dpi while drawing, that´s twice as big as the finished picture. I do this to draw the details properly. It's fascinating to look at the result of such life-long training. 20 years ... ... you've strted early! I started when I was able to hold a pencil. My dad is a graphic-designer, too. He advanced me since I was a little child and taught me about things like anatomy and perspective. As a freelancer, he worked at home a lot, and I liked to watch him. I started playing with Photoshop when I was 12. Knowing your tools well is a big help. Thorndust's my girl. <3 I really love how she came out...just as I pictured her! And I'm really big on having the eye color of my elves highlighted somewhere in their clothing...this is just perfect. Such a huge fan of your work, Dreamcat. <3 I wish I had a quarter of your talent. oh my, I second jeb, indeed! The intelligent, almost predatory eyes glint under her dark bangles, subltle scars on the velvety skin show the harshness of the life this Go-Back chieftess endures and expects others to endure too..Still those eyes have joy of life in them too. Such mesmerizing gaze you've made, Dreamcat! And amazing, full mouth curved in a smile with just the right touch of bitterness..maybe something in her once wanted s softer, simpler life? Or just yearned to be free? Wonderful work, with details like fur collar so soft I want to touch it! Thank you both! Took me the whole day to do this. Thanks for sharing the video, these kind of pictures seem to do take lot of work- but your result is well worth the toil. It's great you share this eye-candy with us. By the way, I only now saw the larger picture (forgot to click it earlier) and it's funny how there her smile doesn't seem bitter at all, but full of life and challenge and even contempt, as if she's ready to spit on your face any minute, should you give her slightest reason to do so. And there is even more amazing little scars on her skin and other details like that! Wow! I've now babbled a lot about what feelings etc. this portrait evoked in me- it would be far more interesting to know what you thought while doing it? Any particular things you were aiming for? Since this is a classic portrait, I just wanted to bring out her personality. I´m a big fan of amazones and of Kahvi as well. I always loved her intense green eyes with thick brows. When drawing, I wanted her to look a little dangerous but not angry. I gave her that little (self-ironic) smile to make her look both, derisive and a little bitter. She looks strong willed, but also a little tormented. Maybe because she´s always on the run, driven by her desires that are never fullfilled, and often get herself into trouble because of stubbornness. Maybe she got some of her scars that way. But she´ll never learn from them (like Cutter), she rather wears them with a little pride. Well, you did a good job. It's gorgeous! Kahvi's always been one of my favorites, and as Embala said, it's like you took a picture of her. She's just so much...her! I saw that Ember on FB and I'm so glad to have tracked down the artist. Between your headshots, the full bodies and everything else... wow, you really do amazing work! Beautiful! Can I ask if you would please consider making a pic of Crucent when you have the time?, if you need to know what she looks like there is my description + pic in The Holtsite, or you can look at my Doodles art-thrad here in the Scroll. I'd love to see what you'd come up with, and I'd be eternally greatful too. As usual, I am completely floored by how amazing you are. <3 Especially with Allegro, one of my oldest characters. Can't thank you enough. Ruske is just gorgeous. O,o love the hair! WOW! What a work! What a scene! Really splendid and worth (in my eyes) of Wendy's work! Drawing all the avatars was a good practise after all. You should definitely feel sorry. Recogntion? That's a relief - I was afriad they migt be fighting over him! I already love your digital portraits, but there is something so great about the marker work. It always seems to capture the motion of the artist so well. The last one has a real old-time comic feel to it. Mistblossom looks like a starlet from the 40's (which I think is a good thing.) Thanks so much for continuing to share these with us. And since these colored sketches are quick to do, here´s the next one. I'm envious. I wish I could do something like that quickly. I love the contrast in their sizes. Looks like she'd be only half as tall as him.